This paper highlights centrifuge model studies on geosynthetic-reinforced soil structures undertaken at IIT Bombay using a 4.5 m radius large beam centrifuge facility. First, attempt has been made to introduce scaling considerations for modelling geosynthetic materials in a geocentrifuge, like, geotextiles, geogrids from hydraulic and mechanical considerations point of view. 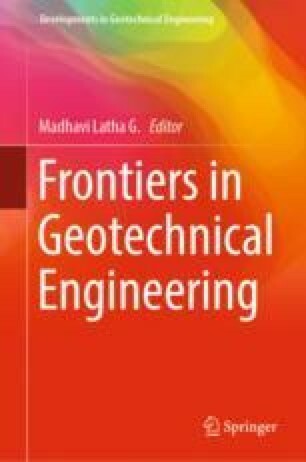 Recent studies on the performance of geogrid-reinforced clay liners subjected to differential settlements at 40 gravities, geogrid-reinforced soil walls with marginal backfill at gravities, geotextile-reinforced slopes with variable gravity level and geosynthetic-reinforced slopes subjected to rainfall at 30 gravies are presented. The above studies could bring out the importance of centrifuge modelling along with digital image analyses technique for investigating the performance of geosynthetic-reinforced soil structures before and at failure. The analysis and interpretation of centrifuge test results have yielded valuable information for understanding the failure mechanism of geosynthetic-reinforced soil structures. Particularly, the effect of geogrid reinforcement layer in restraining clay-based cracking, effect of chimney drains on the performance of geogrid-reinforced soil walls subjected to seepage, failure mechanism of geotextiles reinforced slopes at the onset of failure and the performance of geosynthetic-reinforced slopes subjected to rainfall using in-flight rainfall simulator are postulated distinctly. The author would like to acknowledge doctoral research works of Dr. Ratnakar Mahajan, Dr. S. Rajesh, Dr. D. V. Raisinghani, Dr. P. V. Divya, Dr. A. Rajabian, Dr. Sreeja Balakrishnan, Dr. Dipankana Bhattacherjee, Mr. Jaber Mamaghanian and Master students Mr. Subhro Senguptha, Mr. Bibek Kumar Jha and Mr. Ch. Manikumar. Special thanks are due to Dr. Dipankana Bhattacherjee for providing excellent help in editing this manuscript. The authors would like to thank all the funding agencies (like DST, MHRD, IFCPAR) for sponsoring studies and the centrifuge staff at the large beam centrifuge facility of the Indian Institute of Technology Bombay, Mumbai, India for their active involvement and untiring support during the course of this endeavour.